Hey beautifuls, I am again back with an exciting contest. You know how much I love using handmade soaps. So I have decided to give 2 of my lucky readers a chance to win 1 box of soap each, from Aster Luxury Handmade Soaps. The 1st winner gets Aster Luxury Handmade Soap Box with 4 large soaps. 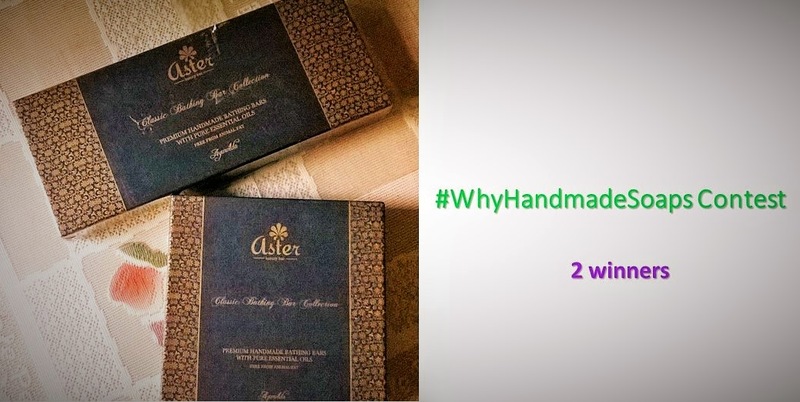 The 2nd winner gets Aster Luxury Handmade Soap Box with 6 mini soaps. 5.Answer in the comments section below:"How do Handmade Soaps make a difference? "Add #WhyHandmadeSoaps.1 entry per person. The best 2 answers win. The Contest starts today and ends on 24th December. It is open to both my male and female readers based in India.